Tennis fans know Belarusian Victoria Azarenka as the number five player in the world. Just two years ago, she was ranked top dog, but as we know all too well, persistent injuries can throw a wrench into a star’s plans. In 2013, she struggled with a persistent right ankle injury that caused her to withdraw from the 2013 Sony Open match against Madison Keys. She also cancelled a highly anticipated match against Serena Williams in Brisbane due to an ingrown toenail that was exacerbated by a spa treatment she’d received. This year, it’s a foot injury that has set the tennis star back. What we see from this story is that foot injuries can be very complex, taking a long time to heal — which can be difficult when you need your feet to get around! The Center for Podiatric Care & Sports Medicine in NYC helps patients rebound from a foot injury as quickly and efficiently as possible. Tennis star Victoria Azarenka has suffered foot and ankle injuries in recent years. What Happened to Victoria Azarenka? Azarenka injured her left foot playing against Lauren Davis at the BNP Paribas Open in early March. The injury flared up again at the Australian Open in January, where she lost to Agnieszka Radwanska in the quarter-finals. While it has been said the injury is “not career-threatening,” there is no set date for Azarenka’s return. 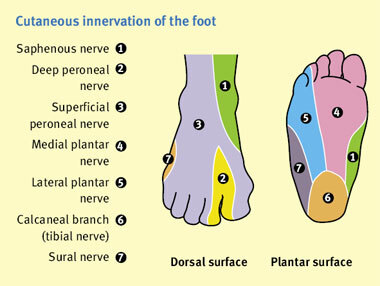 There are many nerves in the foot that can be injured as inflamed feet increase pressure. – Metatarsalgia: This overuse injury occurs in many tennis players who pound the ground, day in and day out. Players suffer tingling pain in the ball of the foot, with an overall tenderness and the sensation that they are always “walking on pebbles.” Physical therapy and Achilles tendon stretching are often necessary to treat the underlying structural issues that lead to this nerve injury. – Morton’s Neuroma: Player suffer a sharp, burning pain in the balls of their feet and occasional numbness when the tissue surrounding the nerves thickens. Usually a neuroma is caused by constant irritation and pressure. Treatment of neuromas may include steroid injections to ease acute pain, decompression surgery that snips ligaments in the foot to relieve tension, and surgical removal of the irritated nerve. – Peroneal Nerve Damage: Athletes who have a high instep often report pressure and nerve pain in the top of the foot near the peroneal tendon. In many cases, blood flow is impaired in the blood vessels and veins. In these cases, the foot “drops” and cannot flex at the ankle. Other symptoms include pain, weakness, and numbness. Treatment can be as simple as wearing custom orthoses, or it may entail surgery and physical therapy. – Nerve Entrapment Syndrome: When nerves sustain repetitive injury or constant trauma, a stabbing pain can occur. If left untreated, sufferers endure severe pain and paralysis-like symptoms. Injections can relieve the acute pain, but decompression surgery is often needed for long-term relief. Nerve entrapment causes numbness and tingling. We haven’t heard which type of nerve injury Victoria Azarenka has suffered, but we hope she is back in tip-top shape soon! The Center for Podiatric Care & Sports Medicine in New York offers the latest technology and treatments to get tennis athletes of all levels back to the game sooner. Our surgeons and podiatrists are experienced, board-certified, and complete ongoing training to provide the best care possible. Come visit us in Westchester or Manhattan.